It's tough trusting new friends, but when they shake your hand and stand by their word, they earn your trust. BSN is a growing giant! The labels have changed, but the company Chris Ferguson created has stayed true to its origins. Sometimes a single product can boost a brand into the stratosphere, where the whole fit world can see it shine. N.O.-XPLODE did that for BSN, but this company didn't just watch the rocket fall back to the Earth. No, it expanded, built satellites around the globe and enlisted a team of athletes to inspire the masses. This is BSN (Bio-Engineered Supplements and Nutrition). It's a small company that got huge. It has signature products dominating the market, but others that are still in research and development, waiting for their chance in the supplement sun. It's been 12 quick years, 38 First-Place awards from this website, and a continuing expansion of innovative product lines. We chatted with Eric Hart, senior brand manager at BSN, to learn how this company went from a tiny operation to an industry juggernaut. BSN started in September of 2001, founded by the original owners Chris Ferguson and Scott James who started the brand in the back of a small supplement store in Delray Beach Florida. Both had worked in the gym business previously and both were bodybuilders who had a passion for fitness, supplements and physique transformation. They were both pioneers who always saw that there was a better way to do things, to innovate, and that is the basis on which BSN was founded; Innovation, Never Duplication. Prizes/Awards: 38 Bodybuilding.com 1st Place Awards and counting. Spokesperson: Eric Hart, Senior Brand Manager; Bodyspace BsnEric. The founders were unhappy with the lack of any real product innovation in the marketplace so they decided to make their own products. The top-selling products in the marketplace at the time were antiquated formulas that didn't deliver on big promises being made to consumers. They wanted to provide the most unique and effective formulas to provide the best possible experience for the consumers looking for real results from their supplementation. The original owners set out to change the standard of what supplements should be and I think they did a great job of it. Who are some important people who helped you in the beginning? What was their role? There is no one person who I would call out and acknowledge as being the most important because it was really a combination of people that drove success. The most important people who helped the brand in the beginning are obviously the consumers who believed in the brand before the brand was well known. The employees took the company on their backs and bled BSN Red, morning, noon, and night. Hell, some of us even worked for free in the beginning just to be a part of the brand. We did it because we believed in the products and what the company stood for (and still do today) and we wanted people to have the same experience and passion for the brand as we do. One of the great aspects of this brand is that we have fans who are just as passionate and fanatic as our employees are. We see the passion played out on our social media outlets, trade shows and in the gyms and if it wasn't for that consumer passion, we wouldn't be here today. BSN has come a long way from distributing its products out of the back of a small supplement store in Delray Beach, Florida. Bigger companies require greater facilities. Tell us a little more about yourself and your background in the industry? I always trained for sports, primarily football and hockey, and like most people, when sports were over it left the question of what now? I didn't want to be that former athlete living off past on-the-field glory. I needed something for the here and now, so I turned to weights. Lifting weights and changing my body was something I was always passionate about, first from a performance aspect for sports, then from a physique perspective after sports. Eventually I found my way into exercise physiology/kinesiology and human nutrition due to my love of human performance. After I received my bachelor's degree I worked in the gym business for seven years, then onto BSN. I started at BSN in Customer Service & Planned Performance division, then into marketing and just kept working my way up. This is another great aspect of the BSN culture, the development and promotion of employees from within. We have employees who started in the warehouse and now are in upper management positions. It is awesome to have employees rise to those levels, ones who have touched every part of this business along the way. You sell all of your products individually, but you also sell them in stacks. What's the purpose behind this? Do they really work better together? I think of stacking like a team. Individually we may be great, but in combination with our teammates, we are phenomenal. The same holds true for supplements; the whole is greater than the sum of the individual parts (i.e. 1+2 = 5, not mathematically possible but you get what I mean). Take a pre- and post-workout for example. If I take a pre-workout to amplify my training intensity, blood flow, endurance, etc., I've provided the stimulus for the muscles to grow, but in order to maximize my full growth potential, I need to stack that product with creatine, glutamine, aminos and protein to realize those actual muscle building gains. I think stacking is essential; one person can't win a game by themselves, and neither can one supplement. Are you coming out with any new and exciting products in the near future? We are always working on new and exciting products; it's our nature. In the near future we will be releasing ISOBURN, a 100% Whey Protein Isolate with fat-burning properties from non-stim ingredients. This will be our leanest low-calorie protein to date. Also we will be releasing a powder version of NITRIX 2.0 which will allow consumers to dial up the pump portion of any other product they may consume pre- or intra-workout or even post-workout to increase blood flow for recovery purposes. We have some big innovations coming out early in 2014 but we play that close to the chest due to the highly competitive nature of our industry. Nevertheless, 2014 is going to be a banner year for BSN and our consumers. 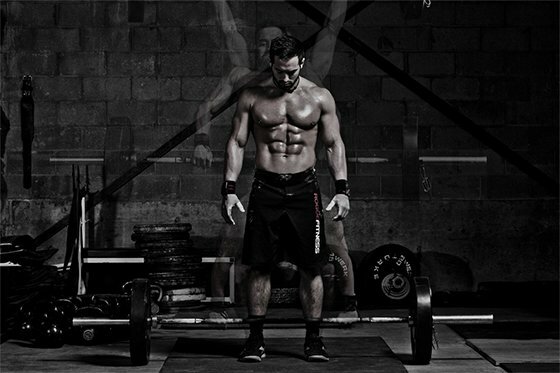 Rich Froning is one of the studs in the BSN stable of athletes. He has won the last three Reebok CrossFit Games, and has been instrumental in the sport's rapid growth. You sponsor a variety of athletes, from Rich Froning, India Paulino, and Courtney Prather, to Joakim Noah and Tony Kanaan, to Ryan Hughes and Cain Velasquez. How do they impact your company? The industry? TEAM BSN has always been an important part of the BSN brand. The athletes are living embodiments of our values and beliefs as a company; they bring the brand to life. The TEAM BSN roster gives us all someone to aspire to. You may look at Ryan Hughes or Amanda Latona and say that is where I want to ultimately take my physique and with hard work, proper nutrition, the right supplementation you could get there. Take Rich Froning for example. He was a former baseball player who saw some Crossfit workouts on YouTube and said I can do that. And he did, but he did it with the goal in mind of being the best he could be at doing it. We feel greatness isn't born; it's made, made through an internal drive and desire to be your absolute best at whatever you do. It takes a willingness to put in the work needed to change both body and mind. The TEAM BSN roster of athletes is the epitome of people engineering their own success. In regard to the industry, I feel the TEAM BSN roster helps foster an image of healthy physiques and a healthy lifestyle, much like the Bodybuilding.com Team of athletes. Companies need quality websites and social media sites. How do you handle online communication with your customers? All of our communication with our consumers is handled in house by us; we want to have a direct connection with our consumers. So whether it is Facebook, Twitter, Instagram, Customer Service ... if you communicate with us, you are speaking to someone who works at BSN HQ. Good, bad, or indifferent, we want to hear from our consumers so we can better service them and give them what they ask for. Also, our social media platforms are a way to recognize our consumers' personal achievements. Let's say a customer is just starting a fitness regimen, can only afford one product, and he/she comes to you. Which one supplement do you recommend? Why? First and foremost before I would even recommend a product to them I would talk to them about their diet and training; we need a solid foundation and framework before we can even think about where to hang the television on the wall. I would make sure they have a proper diet for their need and that their training matches their goals, then once that is in order, then we could talk supplements. Ideally I would suggest a complete protein such as SYNTHA-6 for them because more often than not it is hard to get in enough nutrient-dense meals throughout the day. I look at protein as food, as part of my diet regimen, but that still would be my first recommendation. After that, it all depends on their goal as to what I would recommend. Supplementation should be a needs application, not a shotgun approach. Too often individuals have massive supplement regimens but have poor diet and training. All of the supplements in the world won't make up for a poor diet and training regimen. Amanda Latona is a BSN athlete and IFBB Bikini Pro. She could win her first Olympia in 2013. At the core, the best thing about our industry is the ability to change someone's life. And that isn't hippie pie-in-the-sky talk; it's true. We all get into this business because there is something that we wanted to change about ourselves. The change we seek/sought comes in the form of wanting to add muscle, or wanting to have visible abs, or to squat 500 pounds, to be faster on the field; whatever it is, it still is a need or desire for personal change. If done properly, we help facilitate that change and that is a great feeling. I love going to a tradeshow or the gym and have a customer come up to me and show me progress they've made and we got to be part of that change they had. That motivates me to do this every day after 8 1/2 years. The worst things I see are companies taking advantage of individual's desire for change, making false promises or outlandish claims in order to separate someone from their money. Supplementation has a legitimate place in human performance and nutrition. But from time to time in our industry we get the use of ingredients that border on pharmaceuticals and it draws negative attention to our industry and we look like a bunch of outlaws to the general public. When those fringe ingredients cease being used, it tends to not end well and it is just another black eye to our industry. Tradeshows are important because it is a time we can physically connect with our consumers. We can talk to them about their experiences with our products, gather feedback, find out future needs etc. It is also a time to give back to them as well—through product samples, shakers, shirts and so on. Additionally, back to the TEAM BSN conversation, it gives them a chance to meet an athlete who might have been the motivation that was instrumental in their fitness success. That's pretty powerful. How does BSN handle proprietary blends? Ah, proprietary blends, this is always a fun conversation. Proprietary blends started for BSN with N.O.-XPLODE. It was such a revolutionary formula at the time it launched that we wanted to protect the blend; essentially we didn't want to give away the Coke recipe. If someone was going to try to copy it (and everyone tried), they were going to have to work damn hard at it. We don't use blends with the intention of confusing or hiding information from consumers; it is really to protect the hard work of our R&D team. But we recognize the need for transparency in labeling and moving forward you will still see proprietary blends but transparency within those blends. BSN's corporate team works closely with its athletes to help promote the brand throughout the bodybuilding circuits. 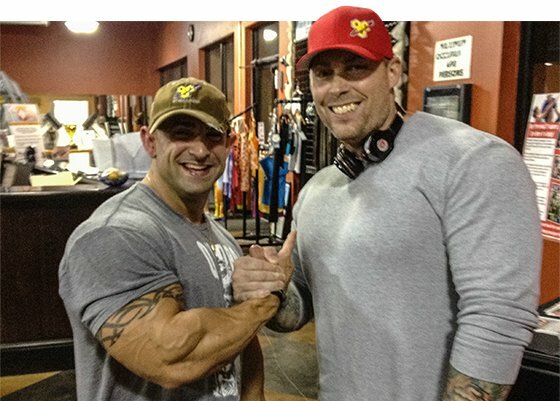 Here IFBB Pro Guy Cisternino greets BSN Senior Brand Manager Eric Hart. Global markets continue to expand for fitness and supplement companies. How do you prepare for this expansion? Are you ready? We recognize the expansion into the global markets and are extremely prepared for it—I would argue we are one of the most prepared companies. To date we are sold in more than 120 countries, but in addition to simply being distributed in other countries, we have sales and marketing teams on the ground in a number of those countries. We have country/region specific formulas to cater to the specific needs of key markets. BSN offers an incredible military discount. Why is it so important to help soldiers? If it weren't for the military, none of us would get to enjoy the freedoms that we probably all take for granted on a daily basis. These men and women put their lives on the line everyday for us. They continually put themselves in harm's way for us. We sure as hell better give them a discount if they choose to spend their hard-earned dollars on our brand. I travel all over the world and see these men and women in full military attire and it makes me stop and think if it weren't for them, I wouldn't be getting on this plane to go to a business meeting. I simply stop and thank them regularly. I take my hand, put it in theirs, and say thank you, from myself and everyone who works for BSN. I ask everyone who travels, if you ever run into a member of the armed forces in the airport, or if you run into them in your community, gym, etc., just take a quick second to stop, shake their hand and thank them for what they do. Brandon "The Prodigy" Curry won his first pro show at the 2013 Arnold Classic Brazil. Ethics are important to supplements buyers, what does your company do to ensure ethical standards? We pride ourselves on ethics. Ethics for us starts all the way back at raw material supplies, where we have a strict and stringent process to qualify the use of ingredients in our products; we probably reject more ingredients than we use. Throughout the whole production process we test our raw materials and finished goods for quality and purity. On the consumer side we do not make any claims that we can't substantiate. We leave the 'bro' science out of it. You see a lot of products with some bold claims on them, or a whole formula with all claims based on only one of the ingredients in the entire formula. To me, that is not being ethical. One thing that upsets me when I see it is the use of the full chemical name of a simple ingredient on a label to make the formula seem more advanced and robust than it really is. If you see something like 2-Amino-5-(Carbamoylamino)pentanoic Acid on a label (which is simply Citrulline), put that B.S. back on the shelf. "The consumers make the industry what it is, so we all better listen." Did you make any mistakes early on, or recently that taught you a lesson about the industry? We definitely made some mistakes along the way but we used those mistakes as lessons for the future. With this industry, the consumers aren't afraid to call you out on the carpet when you make a mistake, so you have to be on your toes and have some thick skin because they will bring it. I think it's good though, helps to keep everyone more honest. When you make a mistake you need to own it and fix it, plain and simple. The biggest mistake I think any company can and does make is not listening to the consumers. The consumers make the industry what it is, so we all better listen. Does BSN perform its own research? How much will science guide your future? BSN is rooted in science and it is inherent in our name (Bio-Engineered Supplements and Nutrition). Sound nutritional science guides what we do now and in the future. For ingredients, we use ingredients with human studies on those ingredients and ensure that we use the proper dosage and dosing format. Currently we are in the process of arranging third-party research on our products. Companies can conduct their own research but then the data is skewed because you can adjust controls to give yourself a favorable outcome. So independent, third-party research is best. Where do you see BSN in five years? The industry is constantly evolving as is our consumer and their performance needs. In 5 years, I see BSN evolving with these needs and emerging as the number one brand in sports nutrition working with consumers to engineer their athletic success.